District recommending to give middle schools only half of the promised G1 funds. Until earlier this month, Elmhurst Community Prep, a middle school in deep East Oakland, was preparing to hire a new Spanish teacher for next school year. A new drama department in collaboration with a partner school was also in the works, as well as increased funding to bolster arts education. This was all thanks to Measure G1, a parcel tax Oakland voters approved last November. G1 increases teacher salaries and provides support for middle-school programs in the arts and languages — especially for schools like Elmhurst, where 97 percent of students are classified as socioeconomically disadvantaged. “It was exciting that there was a commitment from the taxpayers of Oakland to say these things matter to us,” said Elmhurst Principal Killian Betlach, who explained he initially didn't think the money would come through until next year. In December, though, the district surprised middle-school leaders by approving the first installment of G1 funds in their 2017-18 budgets. But now, after schools spent six months planning and doing community outreach on how to use the funds, OUSD is reneging on its promise and schools will have to put their plans on hold. "It means now we will likely not have drama. It means we will not have the same level of art instruction — and we will not have Spanish," Betlach told the Express. The principal added that, along with wasted time and effort, other schools are facing even steeper challenges. "It definitely means a loss. In some cases, the funds have become so integral to people's plans that they have to happen — and that means something else has to go." Measure G1 is expected to generate $12.4 million annually. After a 1 percent administration cost is taken out, an estimated 28 percent will go to charter schools. The remainder will be divided: 65 percent supports raises for teachers, who are now among the lowest paid in the Bay Area. The other 35 percent — around $2.7 million — will be given to district middle schools to build art, music, and language programs. The tax revenue doesn’t begin coming in until July 1, 2017, and initial plans indicated that the money wouldn’t be available until the 2018-19 school year. But the district shifted course soon after the Measure passed, deciding to front the money to schools out of its reserves, and pay itself back the following year. Though this plan required approval from both the G1 commission — a group tasked to oversee G1’s intent is achieved — and the school board, the district assured administrators they could include the money in next year’s plans. By February, Betlach and other city principals had built the new money into their budgets. They began advertising and interviewing to fill new positions. 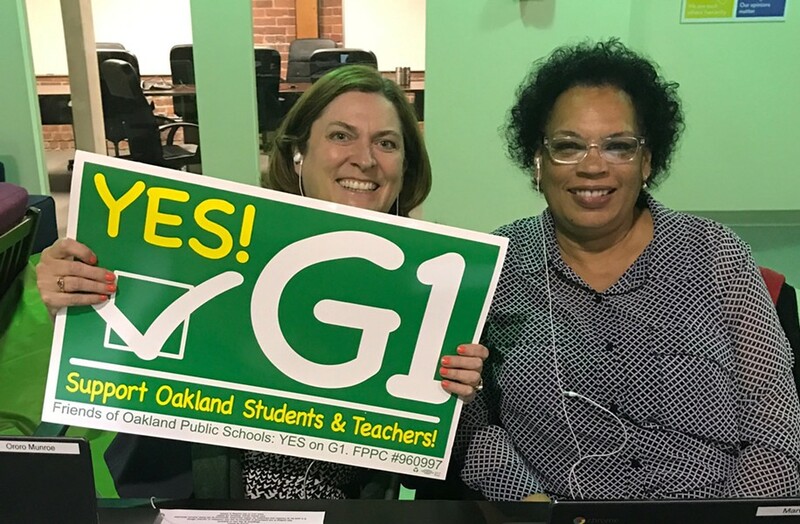 Less than two weeks after the emergency call, the G1 commission voted to approve the district’s recommendation that only half the funds be allocated for the upcoming school year, fronted by OUSD, and half the following year. “This thing is messy. I don’t believe it started off right,” said Misha Karigaca, an OUSD program manager who is part of the commission, during the commission's vote, calling the situation a catch-22. "Our middle schools need a lot of help," he said, " but we are where we are now." If the board agrees with their recommendation when it votes in June, schools won’t see the full amount they expected annually until 2019-2020, when most current middle schoolers will have already moved on. The issues comes after decades of financial mismanagement from the district that continues to affect school funding. In 2003, the state had to intervene, granting a $100 million loan after the district ran up a $37 million deficit — and now that loan has to be paid back, including $6 million next year. In January, forecasts showed the district was again facing a $30 million deficit. A hiring and spending freeze was implemented in the middle of the school year, with the goal to save up to $13 million. They fell short of the goal, however, after desperate school leaders spent all they could before the money they were depending on was taken back by the district. By March, the a district financial report showed the protocol wasn’t working, and would only save between $1.5-2 million, even though it hit schools hard. It is unclear why district officials believed they could finance the G1 funds ahead of schedule. During its meeting, the G1 commission called for more information about how the decision was initially made — a question that, so far, no one at the district has been willing to answer. After the vote, OUSD senior business officer Vernon Hal, who is the top financial adviser reporting directly to the superintendent and presented on the measure during the meeting, told the Express that it was an “upper-level management decision” that resulted from a misunderstanding of Measure G1’s language. “Being zealous in trying to get the money out to schools, some top administrators thought it was the goal to try to get this money out to schools as soon as possible, not realizing that the language talked about doing it a different way,” he said. He emphasized that the shift was not due to cash-flow issues, but rather the data required to determine the right allocation for each school. That calculation, he added, needed to occur at the end of the school year. John Sasaki, the OUSD Director of Communications, echoed Hal's explanation in a statement from the district. "The goal was always to get the funds to schools and kids as quickly as possible," he wrote in an email. "As responsible agents of taxpayer dollars, we wanted to make sure we were not over-allocating for July 1 (especially to charters) and then having to pull money back. Board and Commission members raised concerns about this in the last couple of weeks, which prompted a revision of the timeline for allocating the funds. Unfortunately, this creates a hardship for principals and school communities, who then have to go back and rethink their plans for next year." No matter who’s fault it is, middle-school principals now will have to explain to parents, teachers, and students why budgets won’t as rosy as expected. Voters may also be less inclined to support ballot measures in the future if they think the funds will be poorly allocated.